Order the BIND DNS Administration Reference (Second Edition) book from Amazon, Barnes&Noble, or your favorite book store. The BIND DNS Administration Reference is based on Internet Systems Consortium's BIND 9 documentation including the Administrator Reference Manual (Bv9ARM). In addition to hundreds of improvements (many integrated upstream) and major reorganization of the original documentation, new content, examples, detailed indexing and more cross-referencing were added. This book is an excellent resource which provides a convenient way to find BIND 9 documentation and to learn DNS basics. This book can be considered the definitive resource in a printed book format. The resource introduces DNS and the BIND 9 (Berkeley Internet Name Domain) suite of software, including the "named" server, configuration tools, diagnostic DNS lookup tools, and tools for operating the server. The BIND 9 DNS Administration Reference contains the definitive documentation covering the syntax and all the configuration options for BIND 9.10 (and covers some older and newer versions). The book also includes advanced topics such as DNSSEC for signed zones, automatic zone re-signing, automated trust anchor maintenance, inline signing, hardware security devices, TSIG for signed DNS requests, IPv6 support, incremental zone transfers (IXFR), Response Policy Zones (RPZ), dynamic DNS, rate limiting, NXDOMAIN Redirection, EDNS0, multiple views, multi-processor support, various DNS-related security features, and more. 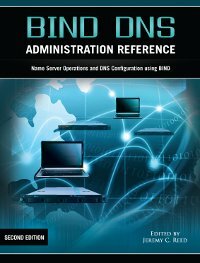 Purchase the BIND 9 DNS Administration Reference (Second Edition) from Amazon, Barnes&Noble, or your favorite book store. Please let us know about any reviews of the BIND 9 DNS Administration Reference. Order the BIND DNS Administration Reference book from Amazon, Barnes&Noble, or your favorite book store.